Up Up Down Down Left WRITE Book Launch Date Announced! HUMANS OF THE EARTH! I’m stoked to announce that my upcoming book, Up Up Down Down Left WRITE: The Freelance Guide to Video Game Journalism, will officially launch on August 5th in print ($14.99) and on Kindle ($8.99)! It’s been a long, crazy trip, but this beast is ready to birth. Huge thanks and shoutouts are in order to my freelance colleague and Mac|Life editor Andrew Hayward for pouring a tremendous amount of time and energy into working with me to edit this book in its various incarnations. Also to @GAMER magazine EIC and industry vet Andy Eddy for writing a stellar foreword and offering additional editorial feedback. Last but not least to the mazillion (ok, a few hundred) Kickstarter backers who helped make the creation of this book possible. So anyhow, for those of you who haven’t been paying attention the past six months, here’s the skinny on what this book is all about and why you should totally buy it! Have you ever dreamed about getting paid to write about video games and the fascinating people who make them? Unless you live on the West Coast and are lucky enough to land a rare staff position at one of the major gaming publications, freelancing is the best way to turn slinging words about your favorite hobby into a viable and lucrative career. The best part? You can do it from anywhere! 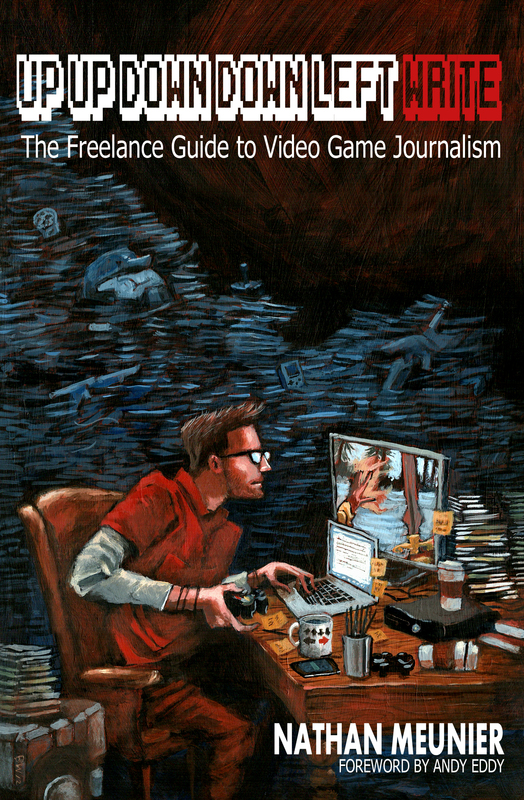 Up Up Down Down Left WRITE: The Freelance Guide to Video Game Journalism covers everything you need to get started along the path to launching and maintaining a successful freelance career in the gaming industry. Pro freelancer Nathan Meunier has written for more than 30 of the top gaming outlets — from Nintendo Power, GamePro, and Official Xbox Magazine to IGN, GameSpot, Electronic Gaming Monthly, and more. In this advice-packed tome for aspiring freelance game journos and more established writers alike, Nathan delivers detailed insights and how-to tips based on many years of professional writing experience. -Work with PR to gain coverage opportunities and free review games. So that’s the snake-tongued market speak skinny! I’ve been getting great positive feedback from backers who are now reading their early copies of the book. Super psyched to have some press coverage being lined up as we speak too. To that end, if you’re an editor, freelancer, or writer who’s in a position to provide some news, review, feature, or interview coverage for the book, please drop me a line at nathan_meunier[at]hotmail.com and we can chat. Digital review copies are available on request for serious coverage inquiries. This entry was posted in Up Up Down Down Left WRITE and tagged book, freelancing, game journalism, how to, launch date, nathan meunier, up up down down left write, writing advice by nmeunier. Bookmark the permalink. Reblogged this on Up Up Down Down Left Write: The Freelance Guide To Video Game Journalism. and bloggers made excellent content as you did, the net might be much more useful than ever before.